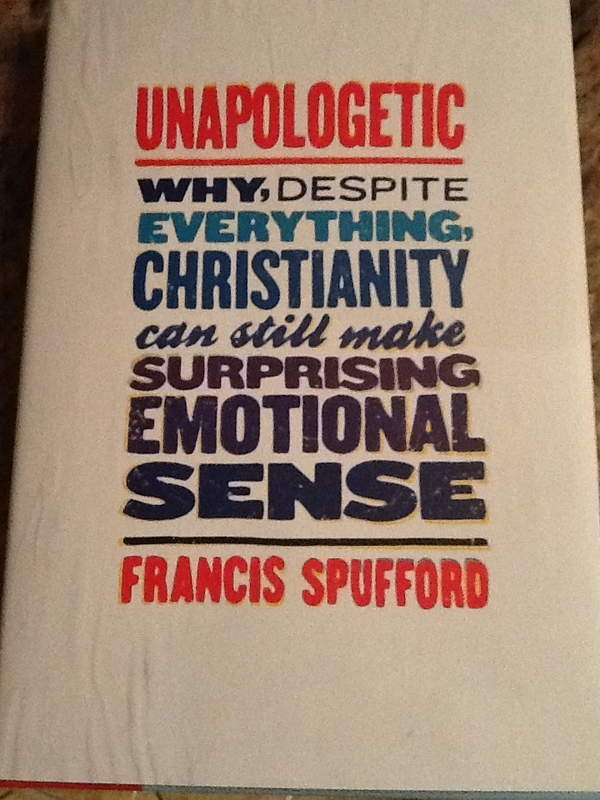 I have been reading Francis Spufford’s Book Unapologetic: Why, Despite Everything, Christianity can Still Make Surprising Emotional Sense. While not for the delicate, this book is a convincing defence of Christianity and a rebuttal of not just Atheists like Richard Dawkins, but also speaks in a powerfully clear manner about how Christianity makes sense in our increasingly secular culture. Some would say this book is irreverent in its tone, I disagree. I think the language he uses is direct and honest. It’s a language that an increasingly secular world understands. I really enjoyed reading the book. A former atheist, Spufford makes clear why Christianity has made great sense in his own life, and why he believes that it can make a difference for others. He skewers the simplicity of some of the anti-Christian jargon and slogans that have become popular among those who see no sense in religion, and Christianity in particular. The passion with which he writes bears witness to how faith has shaped his life. I write to to review the whole book so much as to relate my experience with one chapter of the book in particular. When I pray, I am not praying to a philosophically complicated absentee creator. When I manage to pay attention to the continual love song, I am not trying to envisage the impossible-to-imagine domain beyond the universe. I do not picture kings, thrones, crystal pavements, or any of the possible cosmological updatings of these things. I look across, not up; I look into the world, not out or away. When I pray I see a face, a human face among other human faces. It is a face in an angry crowd, a crowd engorged by the confidence that it is doing the right thing, that it is being virtuous. He looks tired and frightened and battered by the passions around him. But he is the crowd’s focus and centre. The centre of everything, in fact, because if you are a Christian you do not believe that the characteristic action of the God of everything is to mould the course of the universe powerfully from afar. For a Christian, the most essential thing God does in time, in all of human history, is to be that man in the crowd; a man under arrest, and on his way to our common catastrophe. These are very assuring words for me. They speak to me. These words remind me that in my darkest hour, against all odds, there is a friendly Face in the crowd. While Divine, that face is a fully Human Face. That Face has faced its own anger, its own judgement, and scared by its own pain. These words are a powerful reminder to me the indeed, the most essential thing God does is become that Face in a crowd. To see friendly eyes in a time of trial is a great gift – It is the gift God has given us. “Our common catastrophe…’ is a powerful way to describe what we all face. We all suffer at one point or another. For the Christian, in the night-time of our fear, we search for that Face in the crowd who stands with us and illumines our darkness. In Jesus, we have the witness of one who emptied himself and took on human likeness – a human face and suffered, even to the point of death. So, we need not look up – or out. We need only to look across and look in – into the world which God has created. Spufford has it right. God is wonderfully Incarnational. God is among us! It can be terribly hard at times in the mass of people and the crush of pain around us to spot a single friendly Face – but that Face is there – and that face is indeed a Song of Continual Love….. It may seem hard to spot at times…. but look hard – look across, look in….there is a God of Love among the crowd… keep looking…. I’ll keep looking . This speaks to me. I am glad to hear this speaks to you. You have been in my prayers daily. ‘I look across, not up’ is such a wonderful description of praying with the sense of God’s presence. Thank you for this review; I will check out this book.